Kaduna State Government on Thursday flagged-off vaccination campaign against livestock diseases likely to affect seven million animals across the 23 local government areas of the state. Flagging-off the campaign at Rido Village, Chikun Local Government area of the State, North-west Nigeria, the StateGovernor,Malam Nasir El-Rufai, said the need to vaccinate the animals became necessary because agriculture is key of the economy of the state. “livestock provides income, employment, food, manure and transport to all category of people”. Speaking through the Commissioner, Ministry of Health, Dr. Paul Manya Dogo, the Governor opined the exercise would improve productivity which will ensure food security and eradicate poverty using agriculture as the main change agents particularly in Kaduna. He was quick to use the event to reassured livestock owners in the State that his administration has strengthened the security apparatus to curb the menace of cattle rustling, evident in thousands of animals that have been recovered at various locations and returned to the owners. “Livestock fulfil many roles for a substantial number of people in the country and Kaduna State in particular. We shall therefore continue to supporting measures that will increase production and productivity to ensure food security and eradicate poverty using agriculture as the main change agents”, said the governor. Earlier, Commissioner, Ministry of Agriculture and Forestry, Dr. Manzo Daniel Maigari, told the livestock owners that staff of the ministry with active support of Miyetti Allah Cattle Breeders Association of Nigeria (MACBAN), tradition Ardos residents in the area, will penetrate nooks and crannies of the 23 LGAs while the exercise lasted. 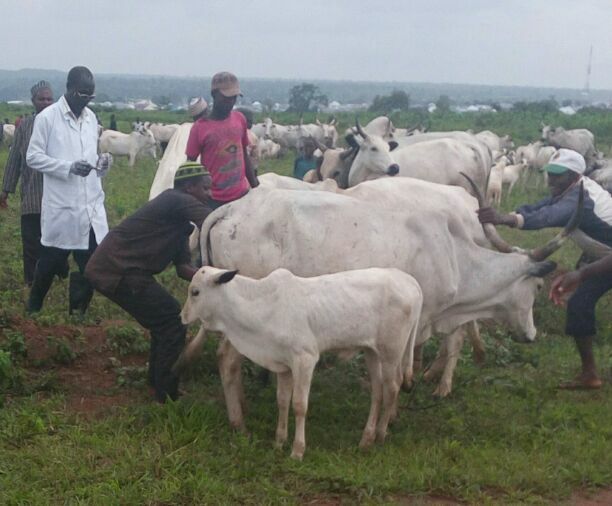 He added that as part of efforts to reduce the wandering of animals through which they contract diseases, the State government, in conjunction with Federal government is preparing with private investors to develop the 17 grazing reserves of the state located at Ladugga, Kagarko, Damau and Gayam communities. He however called on livestock owners across the State to avail their animals during the massive campaign period to avoid spread of diseases.